Melbourne Conservatorium of Music Interactive Composition program and the New Music Studio collaborate to present new works with the rare and unique EMS Synthi-100 in an immersive and spatial sonic experience. The performance features contrasting acoustic and electronic instrumentation with the Synthi-100 in a custom multi-speaker set-up. 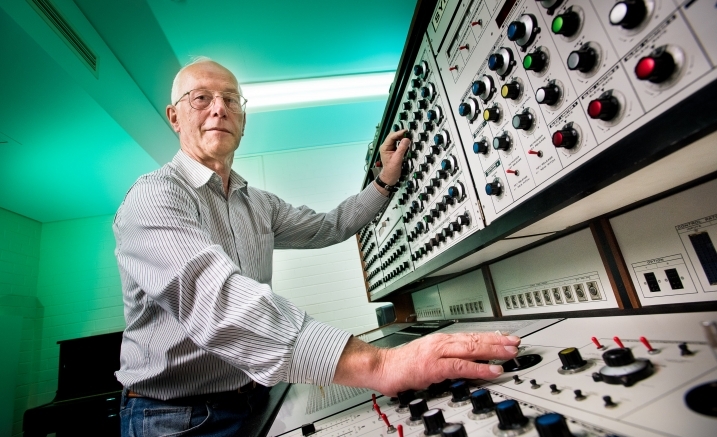 Best known for the ethereal sounds behind the Doctor Who theme music, the Synthi-100 was delivered to the university from London in March 1973 and has become the centrepiece of the Conservatorium’s electronic music studio. Melbourne Conservatorium of Music’s emeritus tonmeister Les Craythorn joins performance staff for this live Synthi-100 concert experience that includes a number of world premieres. This concert is set theatre-style. Seating in the Salon is general admission.